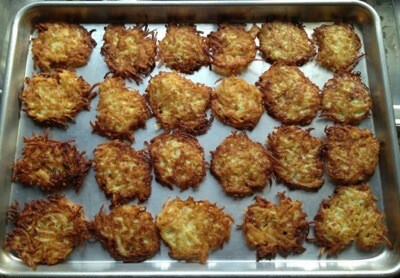 Today my kitchen was filled with the smell of frying potatoes as I prepared the traditional latkes for Hanukah. I was in a relaxed cooking zone, like a form of meditation. It was just me and the quiet of the house, a rarity in a household with two little kids. But I didn’t feel alone. Somehow I felt the presence of my mom and grandma, my two cooking mentors who have passed away. As I cooked, I thought about my Grandma Shirley who taught me how to make latkes, also known as potato pancakes. Latkes, soup, and cookies were her specialties, a handy repertoire to have. Like many of my older relatives, my grandma cooked by feel, often without a recipe. Latkes were no exception; she just had a list of a few ingredients in her head. I feel fortunate that one day long ago I cooked along side her and took written notes to document her recipe. The party in my kitchen continued as memories of other relatives popped into my mind. My dad appeared, the food critic and fan of homemade food. As I sampled the first latke to taste for any needed adjustments to the batter, I could hear my father say, “really good, but needs a little more onion.” He was always spot on. I know he would have given these latkes the thumbs up. They were flat and crispy with just a touch of soft potatoes inside. 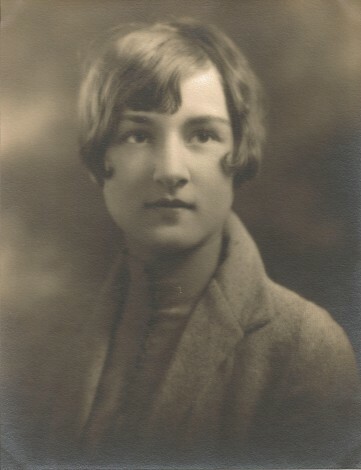 Then, I thought of my mom, the ultimate dinner party hostess. She was an excellent cook and loved to bring people together to share a meal. 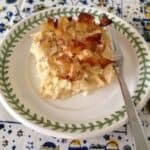 I looked around my house and saw the Hanukah party that was starting to take shape in my house– the trays of latkes waiting and the dining room table set with care. I realized that my mom would have been so proud of me and the adult that I have become. As my kitchen continued to fill with memories and the smell of latkes, I felt surrounded by warmth. Holidays have a way of evoking memories. I hope you have a warm and memorable holiday season too. 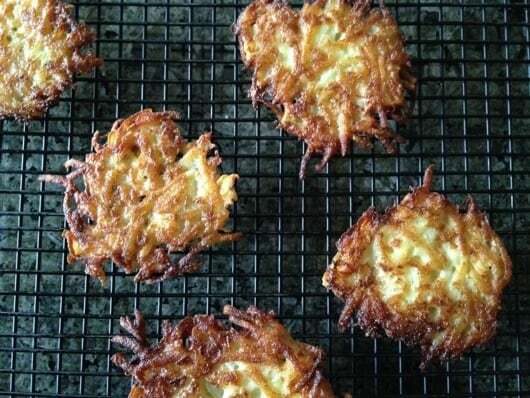 This latke recipe is for a delicious, traditional dish that is a Hanukah treat. 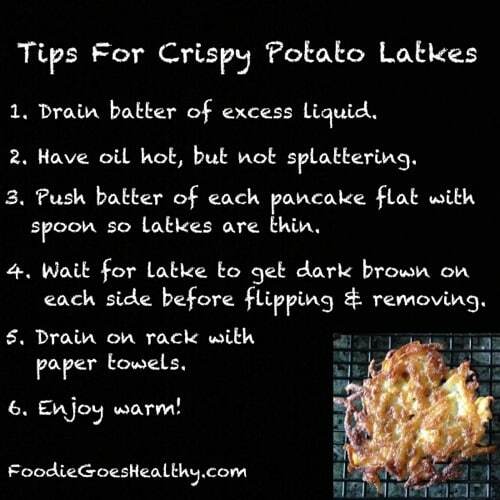 There is no way to “lighten” these up, unless you want to make a completely different dish like my potato latke muffins, which are baked. So enjoy, it’s the holidays. Makes 65 to 75 small latkes. Chop onions in a food processor with the knife blade, and pulse on/off until onions are in small pieces. Alternatively, use a hand grater. Drain onions in a large colander with a plate underneath to catch excess liquid. 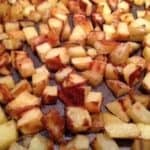 Prep all ingredients and get ready to move fairly quickly once potatoes are grated because the potatoes can turn a darker color. Peel potatoes, and then grate them in a food processor with the shredding disk. Place grated potatoes in the colander with the onions. Drain off extra liquid. The key to crispy latkes is to remove excess liquid. Coat the bottom of 2 large, heavy fry pans with oil. Place the pans on the stove with medium heat. Make sure the oil doesn’t burn. Combine all ingredients (except oil) in a large mixing bowl to form the batter. Have the heat on the stove as high as you can without the oil splattering (usually medium to medium-high heat). I usually run one test pancake in each pan to check the oil temperature. 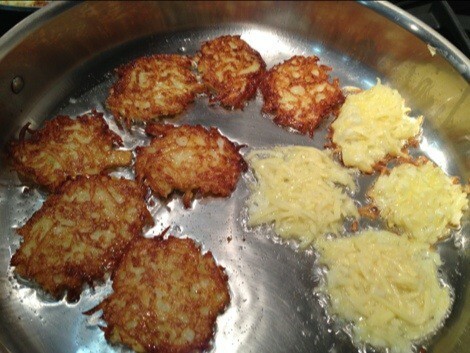 I also test the first cooked potato latke for taste and add more salt or onion if needed. Spoon batter into the hot pans making small, round, thin, flat circles. Cook until dark golden brown on one side, and then flip and cook until brown on the other side. Cook in batches, and add more oil to the pan as needed. As the latkes are made, more excess liquid will accumulate in the bottom of the batter bowl. 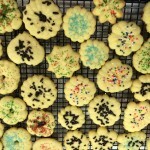 Avoid using the excess liquid; a slotted spoon can even be used. Place cooked latkes on cooling racks covered with paper towels. Serve warm or re-heat in 350 degree oven on baking sheets until warm and bubbly, about 10 minutes or less. Potato latkes can also be frozen and re-heated. 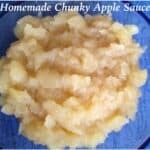 Serve with apple sauce and sour cream. I would love to try this recipe. I have a question. What do you do with the onion juice after draining? Is it used in the batter? Thank you. You discard to onion and potato juice. Alternatively, you can drain the potato and onion by wrapping them in a clean kitchen towel and squeezing until the vegetables are dry and the towel is wet. When you put the batter in the pan, you don’t want excess liquid. Sometimes more liquid gathers in the batter bowl, so I use a slotted spoon and leave the excess liquid behind. The point of all this is to reduce oil splatter when placing the batter in the pan and to make crispier latkes. Happy holidays. Dana! Thanks for posting! 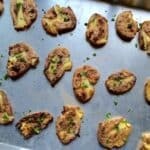 Is it ok to use flour vs matza meal? Hi Carrie- yes, both matzo meal and flour work well and are commonly used. However, I think flour is a little lighter. You’re the spitting image (what a strange expression) of your grandmother, and I would gladly eat at least a 1/2 dozen of those latkes. Have a very Happy Hanukah! Hi Nancy, thanks so much. Sorry I missed you yesterday. Happy Hanukah to you too. mmmm….I can smell them from here!